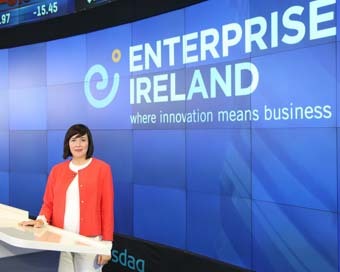 Catriona Barry (pictured), CEO of trakax, and her brothers Cormac and Colm Barry rang the Nasdaq Stock Market Opening Bell in New York’s Time Square today. The trio behind the video editing platform, trakax, won this experience as part of the Start-Up Village Pitch Competition sponsored by Nasdaq and Enterprise Ireland Pitching at SXSW in Austin. The company’s Android product, “trakax” and the Windows PC product “trakaxPC”, are designed to enable users with little or no video editing experience turn their captured videos into compelling, interesting and fun movies. trakax can also be used in the workplace, allowing small businesses to create interactive videos and slideshows to highlight their product offerings. These videos can then be quickly and easily uploaded to YouTube, Facebook, or the TV screen on your premises. trakax also lets businesses create Podcasts, allowing you to upload conferences, speeches and training videos and share them with colleagues and clients worldwide. Speaking just before the ceremony, Catriona said “I am a combination of excited, terrified and delighted. We have grown trakax from the basement of my parent’s house, so to be here in New York today, ringing the Nasdaq Opening bell, is just an amazing feeling. We intend to enjoy every minute”. trakax recently announced that Dale Sohn, former President and CEO of Samsung Telecommunications America, has joined their Executive leadership team and has been elected to the Board of the Company. Dale will provide his expertise in areas of licensing, partnership development and with marketing and sales strategies.